Student media will host all 13 Associated Student Body executive officer candidates for a debate tonight in the Overby Center auditorium, which will replace the candidate debate that was previously hosted and moderated by the ASB itself. Here is what the three presidential candidates want students to know about them before the debate. Leah Davis. Photo by Katherine Butler. My name is Leah Davis, and I am a junior psychology student from Tupelo. I initially joined ASB through Freshman Council. That program connected me to campus and really ignited my passion for ASB. I served on several committees that year and got involved with any ASB initiative I could. I learned so much about our campus and the students here, but I also learned the intricacies that ASB is comprised of. For the past two years, I have been serving as the co-director of inclusion and cross-cultural engagement for ASB. I have been on the frontlines of student advocacy. I have diligently worked to include all student organizations, bring everyone together and foster dialogue about various campus issues such as inclusion, awareness and community. These experiences have shown me improvements that ASB can make to ensure we are representing the students as best we can. The slogan for my campaign is “Moving Forward.” In order to best serve students, ASB must continue to progress and tailor its initiatives and goals to meet students’ needs. I believe this can best be accomplished by focusing on access, consensus and wellness. Many students feel that ASB student leaders are very disconnected from the student body. Additionally, students often feel ignored by the university’s administration. As students are the center of this campus, it is crucial that everyone feels confident in their leadership and representation. ASB must secure direct representation with the chancellor and senior leadership. This will be one of my primary goals. ASB has an opportunity to evaluate and reshape its existing structures to align with student needs and become a more effective advocate in our shared governance system. To establish consensus, every student needs to be represented within ASB. By selecting more diverse and qualified candidates in my Cabinet, ASB can ensure that students are effectively being represented. Finally, ASB can do more to highlight the growing mental health problem on campus. As students, we should support each other and discuss the issues that we face. By establishing a health and wellness position on ASB, we will do everything we can to ensure that all students get the services they need. Most importantly, I want the students on this campus to be seen and to feel confident in their representatives. The students are the heartbeat of this campus, and they deserve a student government that truly cares about them and their needs. My name is Leah Davis, and I would love to be your next ASB President. My name is Tom Fowlkes, and I am majoring in accounting and public policy leadership. Born and raised up the road in Memphis, Tennessee, I come from a family that bleeds red and blue — we traveled religiously to Oxford for home football games. My father and his two sisters graduated from Ole Miss years ago, and when I enrolled, my brother and three of my cousins were on campus to greet me. I have always loved the University of Mississippi, but what truly brought me to Ole Miss, as a student, was the momentum surrounding this place. Whether it’s the academics, athletics or atmosphere, no one can deny that we have the potential to be a preeminent school in the SEC. But even with all of this momentum, there have been daily issues during my three years on campus that continually hold our school back from achieving its true potential. That is why I am running. I want what we all want: the school to be its best so that we can be our best. So, to help us unleash the Ole Miss MomentUM, I desire to do three things: communicate, advocate and accelerate the things we do well. The first thing we, as an Associated Student Body, must do is bring the daily workings of the student body’s government down to those it represents: the students. From an intense social media push that presents daily updates on the actions of the ASB to frequent polls that gauge student opinion and drive government action, we must be able to present the students’ government to them constantly and transparently. Secondly, once the ASB has communicated effectively, we must advocate for the students effectively. That means opening conversations with the administration and faculty about our needs, and at times, that means a strong, unified, relentless call for action. Finally, we must accelerate the parts of our government that work. I appreciate the work of this past year’s student government, for they brought the executive and legislative branches much closer. We must continue to improve that process by better relaying everything that occurs within those interbranch meetings to the students. On a personal level, since arriving on campus, I sought to involve myself in organizations that help drive our momentum. 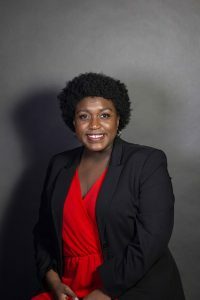 My first experience with the Associated Student Body came through Freshman Council and continued as I held a seat on the ASB Senate the spring of my sophomore year, serving as the vice-chairman of the inclusion and cross-cultural engagement committee. This year, I was only able to serve briefly on the ASB because a required accounting night class kept me from being able to attend the weekly cabinet meetings, but during that time I learned the inner-workings of the executive branch and the office of the presidency. 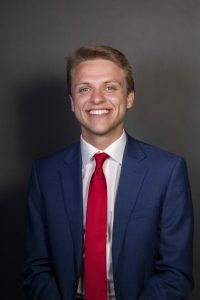 Outside of the Associated Student Body, I have been blessed with the opportunity to serve for three years in the Ole Miss chapter of Coaching for Literacy, which is a non-profit organization that partners with the athletic department to raise money and awareness in the fight against illiteracy in Mississippi. 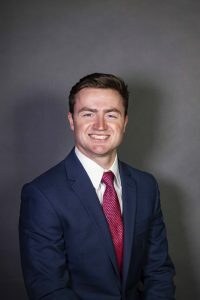 I am a member of an IFC fraternity, Sigma Chi, where I co-managed our yearly philanthropy week benefitting the William Magee Center for Wellness Education, and I am a member of the Sally McDonnell Barksdale Honors College. My faith in God has led me to attend Reformed University Fellowship as well as Christ Presbyterian Church on Sundays, and I use my time outside of clubs and organizations to cheer on my friends on the Ole Miss athletics teams. Now that you know a little about me, I want to learn a little about you. Throughout this campaign, I want to hear every student’s ideas on how we can unleash our momentum, and if you see me around campus or at my sign, please don’t hesitate to approach me and say something. I promise I won’t make you take a sticker. This campaign is about harnessing our potential as a university and as a student body. My name is Tom Fowlkes, and I need your help. Only together can we unleash the Ole Miss MomentUM. Barron Mayfield. Photo by Katherine Butler. When I first arrived on campus, I didn’t know a single person. Since then, I have been given a family that loves and supports me, afforded opportunities I could have never imagined or asked for and received a place to truly call home. However, I have oftentimes felt disenfranchised and as though the challenges I encounter on a daily basis go unaddressed. I’m running because I want to ensure that we, as students, are given every opportunity to succeed and excel. Throughout this campaign, I always go back to students first because, unfortunately, we are simply not the priority right now. Time and time again, we are left out of the conversations that matter and denied a voice on issues that directly impact us. The IHL, the governing body of universities in the state, has no student representation. The administration ignores the student voice on things as simple as fixing the blue lights and offering more SI sessions. Within the ASB Senate, transfer students, international students and student veterans have no means of representation despite the fact that they face unique sets of issues. The alumni and the national news media drag us through the mud, and we dedicate weeks of our time catering to hate groups or dealing with offensive Facebook posts instead of working to improve students’ days. “Students first” means advocating for every student every day. When we make a commitment to putting students first, and when we insert ourselves into conversations that matter, we can make a real and lasting impact that will benefit students for years to come. I have found that the biggest issues we face on our campus are not political and cultural, as outsiders might have you believe. Rather, they center around our unique student experiences. Things like the broken registration process, difficulty in obtaining materials like scantrons and books and an inconsistent grading scale are real problems that we all encounter. To address these real issues, we must work together to increase representation, advocacy and results. From the IHL down to the ASB Senate we must ensure our voices are heard so that our unique perspectives are always considered. When it comes to mental health resources, academics, student life — any aspect of the student experience — we must be passionate about advocating for every student every day. Finally, we must deliver results because we can no longer afford not to. My name is Barron Mayfield, and I am running to serve as your next Associated Student Body President because it is time that we put students first.